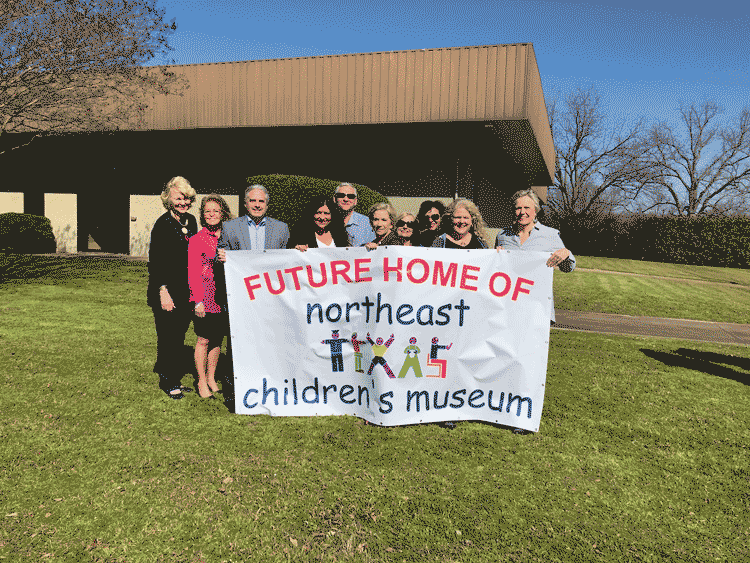 After two years of an uncertain future, the Northeast Texas Children’s Museum is pleased to announce the purchase of a 26,500 sq. ft. building along Highway 11 East in Commerce, Texas. The building is located on approximately 7.9 acres and meets the museum criteria for building space and an outdoor play area. The move from the current location is scheduled for September 1, 2019. The Northeast Texas Children’s Museum had its beginning in the defunct David’s Grocery Store in early 2002. The museum struggled with the rising cost of the lease, and in 2006, under the leadership of Dr. Keith McFarland, Texas A&M University – Commerce offered a new location on the campus. The Children’s Museum moved to the building formerly known as Watson’s Cafeteria. For the next thirteen years, the Children’s Museum continued to grow, increasing the number of visitors each year. When the future of the Museum at this location became uncertain because of lease restrictions and the age of the building, the Board of Directors were forced to consider other possibilities. One option was to relocate as part of a proposed agricultural complex on Highway 24. “The timing of vacating the current location and the availability of moving to the proposed agricultural complex left few options for the Children’s Museum. We certainly understand the necessity for the Children’s Museum to make this move. Texas A&M University – Commerce will certainly continue its support of the Children’s Museum,” said Dr. Mark Rudin, President of Texas A&M University – Commerce. When a building became available just a few miles east of the current location, the Museum’s Board of Directors began to envision this building as a potential site for their new home. In November 2018, Sharline Freeman, Executive Director of the Children’s Museum, approached the Commerce EDC Board of Directors (owner of the building) with a request to purchase the building. The CEDC took this under consideration, and with 30,000 annual visitors, acknowledged that the Children’s Museum is a great asset to Northeast Texas, especially Commerce. “Quality of life is important when working to attract new businesses, and the Northeast Texas Children’s Museum has become a landmark for Commerce. This purchase is a win / win for both entities. The size and layout of the building will provide ample space for existing and new exhibits and offers plenty of space for the outdoor play area. When their enhancements are finished, it will be a showcase for our community,” said Bonnie Hunter, Executive Director for the Commerce EDC.